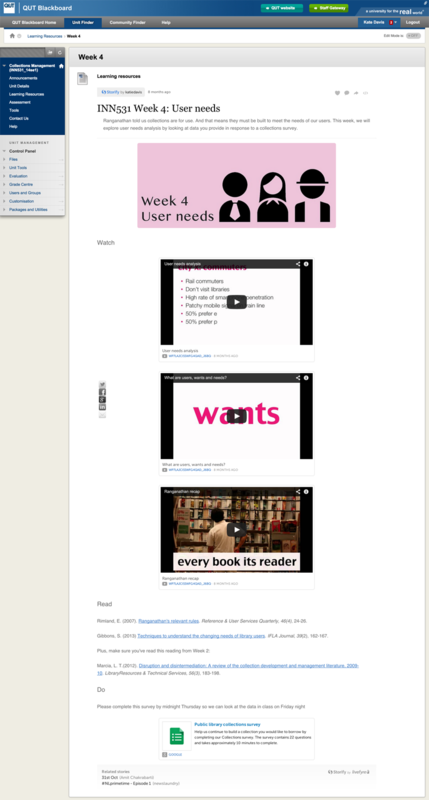 This year, I’ve started using Storify to curate my learning resources each week. In this playlist, I give an overview of why I use Storify and how I do it. The first video provides an overview while the second runs through the nitty gritty of creating stories. I connect with my students in a number of places around the web: on our unit site (which might be a Blackboard site or a WordPress site); in a unit Facebook group; and on Twitter using a unit hashtag. Last semester it occurred to me that I could really easily push the weekly learning materials out to my students in all these spaces by curating the resources in Storify. So for a little while, I put the resources onto Blackboard and then created a story to share on Facebook and Twitter. I create the story, embed it in Blackboard, tweet the link, and post the link in our Facebook group. Embedding, tweeting and Facebooking take about 30 seconds each. Yep, there’s some redundancy in this. I’m making the same thing available in more than one place. But it only costs me 60 seconds to push the story out on social media and by taking the resources to them, I make my students’ lives a little bit easier (and increase the likelihood they’ll engage with the readings and mini lectures before coming to our workshops). In fact, using Storify actually saves me time. When I post the resources directly onto Blackboard, I use the HTML view and write the HTML so I can make sure it looks nice and tidy. Pulling the resources into Storify and then embedding the story in Blackboard takes me significantly less time than messing about with the HTML in Blackboard. For more information, you can check out a case study QUT’s eLearning Services wrote on my use of Storify.